A cardiac surgeon followed the advice of his wife and a radiologist friend—and it probably saved his life. As a cardiac thoracic surgeon, Karl Karlson, MD, of Hartford, Conn., certainly knows how to recognize and treat heart disease. But when the patient has no symptoms, is physically active, and is a physician, there’s no reason to suspect there’s a problem. That’s why Karlson, 57, credits his wife and a CT scanner with a far lower associated radiation dose for saving his life. “When I was 55,” Karlson explains, “my wife said to me, ‘You’ve got a very stressful job. Even though you feel fine, I think you need to be checked for heart disease because you’re getting to be that age.’” Like most physicians’ wives, she had to be persistent about his being checked—and persistent she was for six months or so. Karlson had been reluctant to undergo coronary CT angiography (CTA) because of the radiation dose associated with the imaging study. Lifetime radiation dose is a growing concern among the medical community, and there were no indications that Karlson needed to take the risk. He had no hint anything was wrong, was quite active, and did not smoke. Karlson kept in touch with a colleague, Neal Epstein, MD, who had been chief of radiology when he practiced with Karlson at Saint Francis Hospital and Medical Center in Hartford. “I knew him and through other medical acquaintances here had kept in contact,” Karlson says. Epstein eventually began working at Lenox Hill Hospital in Manhattan, N.Y., and the facility had acquired the Brilliance iCT 256-slice CT, which Philips Healthcare launched at RSNA 2009. Lenox Hill got the scanner as part of an advanced trial, says Dominic Smith, vice president of global marketing for CT and nuclear medicine for Philips Healthcare. Epstein suggested that “as a surgeon who is anatomically oriented and very concrete, I might want to, rather than just going through a routine stress test and get circumstantial evidence, have a CTA on their new, low-dose scanner,” Karlson says. The surgeon was impressed by the scanner’s capabilities: It could scan the heart in two beats—less than 2 seconds. Karlson and his wife planned to stay in New York for the weekend following his CTA test at Lenox Hill on a Friday. It turned out to be a good decision. When Harvey Hecht, MD, FACC, a nationally and internationally recognized expert in cardiac imaging and preventive cardiology and a strong proponent of the Brilliance iCT scanning system, reviewed Karlson’s test, he immediately saw trouble: Karlson had a severe blockage on the left side of his heart. “A very short distance from the end of the left main coronary artery, where it splits off, I had a tight blockage that was seen,” Karlson explains. Additionally, it was discovered that Karlson was born with a nondominant right coronary artery, meaning the left side of his heart was doing the work of the entire heart. The blockage was very serious, a time-bomb waiting to “go off.” About 10% of the population has this condition, Karlson adds. Everyone agreed the next step was a conventional angiogram in the cardiac cath lab to confirm the CTA results. The physicians agreed that some day they may feel comfortable basing cardiac surgery solely on CTA, but for now they had to rely on the gold standard—a coronary angiogram. Had the results of Karlson’s CTA been normal, Hecht says, it would have eliminated the need for a regular angiogram. He says he may also substitute a CTA for an angiogram when patients have abnormalities that make a catheterization risky. CTA is not ready for use as a screening tool, according to Hecht. However, he says, as the technology has improved and the radiation dose reduced, it’s becoming a more important and reliable test. Karlson’s wife was nervous as he underwent the catheterization, as was Karlson himself “because that’s not my total comfort zone,” he says. However, as soon as it was determined that he needed bypass surgery, he says he was fine. “I knew we had found a problem and I knew we could fix it. I knew it would be fine because this is what I do every day and surgery was the next step,” he says. Nirav Patel, MD, performed surgery on Karlson that afternoon, and the patient was out of the operating room and checked into intensive care by 7 PM. After a few days in the hospital, “I was back at work in two weeks and in the office and operating in four weeks,” Karlson says. Karlson was so impressed that his wife’s intuition saved his life, he recommended his siblings undergo CTA at Lenox Hill, too. The only known case of heart disease in Karlson’s family was a grandparent who had been diagnosed in his 80s. Karlson wasn’t overweight and his cholesterol at its highest was 200, which is borderline normal and 10 years ago would have been considered absolutely normal. Karlson, the oldest of six, convinced his four brothers to be scanned; his sister declined. “We had a Karlson day at the scanner and ran everybody through,” he says. Turns out that every one of his brothers had some blockage in exactly the same area as Karlson. “It’s there and in the same place in everyone in the family,” he says. Because it was caught earlier than their brother’s, his siblings did not need bypass surgery. His next youngest brother by four years required a stent, and the others are using aggressive medication and exercise therapy and will continue to be closely monitored. Hecht says he finds the second half of the story as interesting as the first since every one of the Karlson men was asymptomatic yet found to have cardiac abnormalities. What the CTA so clearly shows is soft plaque that can build up in the vessels, Smith says. “And it’s that soft plaque, should it rupture, that would cause a stroke or heart attack.” Each year more than 1 million people in the United States suffer a heart attack and about one half of them die, according to the American Heart Association. “It’s a growing problem,” Smith says. He suspects that some day researchers will be able to do genetic tests that show who is at risk of developing coronary artery disease. The genetic test could be used to determine who might need screening CTAs. The Brilliance iCT system, he says, has the advantage of being able to deliver low-dose protocols that reduce radiation dose by up to 80% and injected contrast volumes by 35% compared with many earlier CT scanners. “This provides you greater diagnostic confidence through the elimination of image-degrading scatter,” he says. One physician at Lenox Hill had told Karlson that “‘you were a Tim Russert [the 58-year-old NBC News Washington bureau chief who died suddenly of a heart attack in 2008] waiting to happen.’ I’m glad I had a different outcome,” he says. 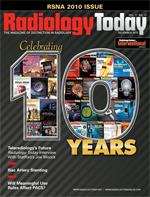 — Beth W. Orenstein, of Northampton, Pa., is a freelance medical writer and regular contributor to Radiology Today.